My second juicing machine was Samson 6-in-1 Juice Extractor. It’s a good machine but the auger is prone to staining. I’m glad to see that it’s been addressed in the Samson Advanced Juicer. This multi-purpose machine is equipped with durable Ultem auger and Ultem juicing screen. No more staining, plus the warranty is now on par with high end slow electric juicers. This advanced juice extractor is a single auger masticating juice press which slowly squeezes produce at 80 RPM, maximizing juice yield and at the same time minimizes oxidation. The slow extraction allows the juice to preserve its nutrients, vitamins, and enzymes which can last 3 days if stored properly. Other than juicing, you might also find its other capabilities helpful. If you feel like making a homemade ice cream, grinding coffee, glutinous rice cakes, etc., all you have to do is grab the appropriate nozzle. It comes with adjustable pressure control to maximize the juice yield. The higher the number the more pressure it applies. Setting #1 should be used for softer fruits, setting #2 for most items and setting #3 is good for wheatgrass, pine tree needles, and leafy greens. 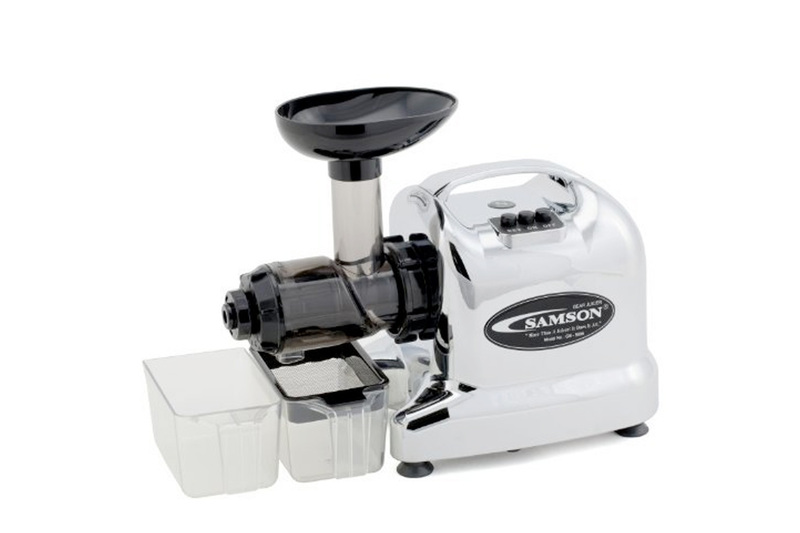 Based on personal experience, Samson juicers are very easy to operate and assemble. It will just take a few minutes of getting used to. The feeding chute is only 1.5 inches in diameter. You’ll have to cut your produce into small pieces for it to fit on a small opening. You don’t want to jam your juicer with huge chunks of produce. You will need to place some pressure on the food with the pusher to help it feed into the auger properly, it’s not self-feeding. Just remember not to overload it otherwise it will stop working. However, you can use the reverse button in situations like this. The detachable parts of this juice extractor are top rack dishwasher safe. Wash them on the low-temperature setting. Skip the high heat drying cycle as this may warp the plastic parts. Otherwise, you might consider cleaning up the parts by hand, then just allow it to air-dry. To make things easier just make sure to clean your juicer as soon as you’re done using it. The pulp in the juicing screen will harden if you let it sit for a few hours. Cold press juicers separate pulp from the juice in a slow manner, almost similar to the way we chew. This slow juicing process maximizes yield and preserves the high amount of nutrients and enzymes in your juice. This is why you can store a cold-pressed juice for 72 hours. With fast juice extractors, you only have 24 hours before the juice spoils. It’s highly advisable to drink your juice right away but if you want to take advantage of the maximum shelf life, use an airtight glass container when storing it in your refrigerator. What Kinds of Produce Can Samson Advanced Juicer Process? This machine can process all kinds of produce such as soft fruits, hard veggies, citrus fruits, green leafy vegetables, soybeans, and almond nuts. Hard produce includes asparagus, coconut, pumpkin, cilantro, carrots, apple, ginger, cucumber, beets, garlic, celery, watermelon, bitter gourd, sweet potato, cauliflower, yakon, pineapple, turmeric, pear, fennel, pepper, and broccoli. Soft fruits such as tomato, pomegranate, mango, avocado, blackberry, grapes, peach, cranberries, kiwifruit, melon, strawberry, and papaya can be turned into a puree using the low-pressure setting. Leafy greens include parsley, lettuce, peppermint, brussels sprout, spring onion, collard greens, basil, dandelion greens, pine tree needles, wheatgrass, kale, spinach, cabbage, moringa, and beet greens. Citrus fruits like grapefruit, lemon, lime, orange, tangerine and mandarin. You can also make soy and almond milk provided that you soak your nuts or beans overnight. The complimentary nozzles along with the mincing cone can help you make pasta and noodles, grind coffee, make a homemade ice cream, mince seasonings, and prepare ingredients for glutinous rice cakes. Process basic seasonings such as onion, garlic, ginger and pepper for making sauces or simply if you need a hand on chopping or mincing. Choose fresh fruits, cut them into pieces and store them in the refrigerator. Then make a sorbet or fruit shake by adding yogurt, some milk and sugar to your heart’s content. You can grind coffee beans (5 to 6 pieces at a time) using the mincing cone and the mincing nozzle. Some coffee beans (especially gourmet coffees) have higher oil content, this has to be dried overnight for easier processing. All the nozzles and mincing cone can be used to make pasta of varying shapes and sizes, you can choose between a flat or a round noodle. Nozzles with a larger opening can be used to form breadsticks. The bad news is you still have to prepare your dough. 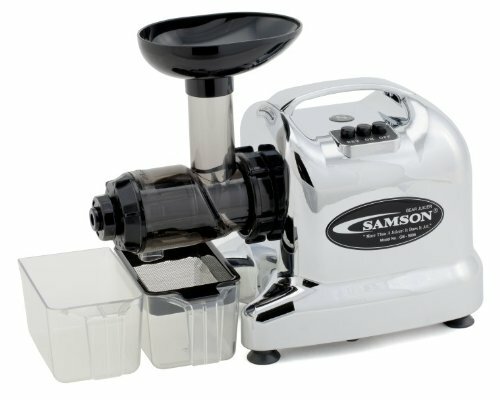 Samson Advanced Juicer is an affordable and powerful masticating juicer that can go head to head with some of the top end masticating juicers. It can process all types of produce and also offers other non-juicing functions as mentioned above. In addition, it’s easy to use, easy to clean and provides a long warranty coverage which is not common among other brands. If you’re serious about juicing and if you’re looking for a budget-friendly masticating juicer, without any doubt Samson Advanced juicer is the way to go.